Many years back when renowned shotgun cartridge manufacturers Eley started publishing a little diary, as a thank you gift for their customers, they can hardly have expected to generate the loyalty they have to the diary itself. Packed full of helpful little hints and tips on shooting seasons, cartridge loads and much more, it has become a must have item for many shooting enthusiasts. There are those that would tell us the sport of shooting is in decline, but if sales of this great little item are anything to go by it is getting more popular every year. The format of the Eley Diary hasn’t changed in many years, a perfect pocket sizes, with a little pencil stowed in the seam, and I for one look forward to continuing to use one for many years to come. Eley Ammunition, Eley Shooters Diary. Bookmark. hi are you going to be haveing eley shooters diary 2017 in ? 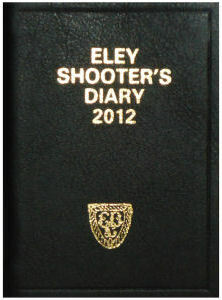 We will be stocking Eley Shooters Diaries for 2017. They will be available to buy in November.